One of my goals this summer was to make fresh bagels. A neighbor of ours told us about making them for a big group and how easy it was. I thought: We like bagels, I can make bagels, I am going to make some bagels. That, of course, did not happen. Stuff happens and other stuff doesn’t happen and then you don’t get around to making the bagels. Until last weekend. We had a friend staying with us so I thought it would be a good time to stop putting it off and to get cracking on the bagel production. Now I can say I done it. So, I don’t have pictures. Sometimes I think I should document new things and then I document new things. Other times I get wrapped up in the experience and the camera stays on the shelf. This was a camera-on-the-shelf situation. Making bagels was really easy. I mean, why haven’t I done this before? Granted, they could have been better. Key ingredients are high-gluten flour (makes them chewy) and malt syrup (the sweetener). I had neither and could not readily acquire either, so I substituted, I used bread flour (not the all purpose flour we typically have on hand) and honey. A few ingredients in a mixer the night before and the dough was stretchy and workable. I divided the dough and formed it into eight rings. Those rings sat on a covered sheet pan overnight to rise slowly. In the morning I boiled them for about 30 seconds, then baked them for 16 minutes at 450 degrees. They turned golden on top and were tasty I tell you. Fresh bread is always tasty so it was hard to tell how much of the tastiness was the bagelness and how much was the fresh breadness. In any case, they got gobbled up with high praise. You get what you get and you don’t get upset. I definitely want to make bagels again. Next time I hope to get high-gluten flour and malt syrup. The flour I should be able to get somewhere. The malt syrup I can steal from my home brewing ingredients if necessary. Even if I use the same ingredients again it would be worth it. I now have one more item to add to our menu, even if it is only occasionally. Bagel’s baby. Finally. My family went away for a few days last week–took a trip south while I stayed home and worked. Since they were gone for a while I thought I would take a weekend day to do some birding some place new. I thought about driving out of state–maybe to Plum Island or to the Maine coast somewhere. But then I thought I would stay close to home. There are lots of places in Vermont I have not been at all, and plenty where I have not been birding. So I headed north and east on Sunday morning to see what I could find. 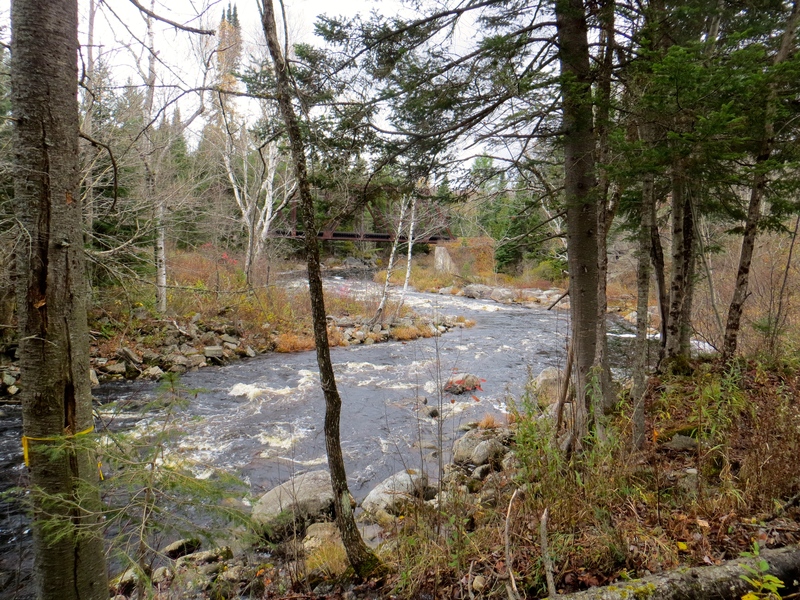 A couple hours of driving took me to Wenlock Wildlife Management Area. I parked in a pull-off on a dirt road and headed out with binoculars in hand. Just down the road was a bog with lots of standing dead trees. I thought this might be a good spot to find Black-Backed Woodpeckers. That was a no go, but I did see and hear lots of other birds–Juncos, White Throated Sparrows, Ruby Crowned and Golden Crowned Kinglets. 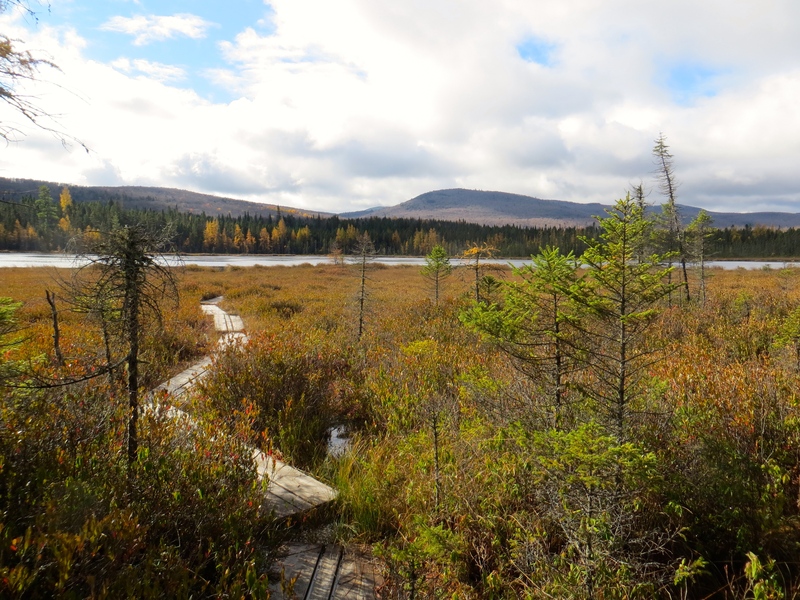 I had read about a trail off this road that offered good birding habitat and and access to Moose Bog. It took me a bit to be sure I had the right spot, but eventually I turned off into the woods. 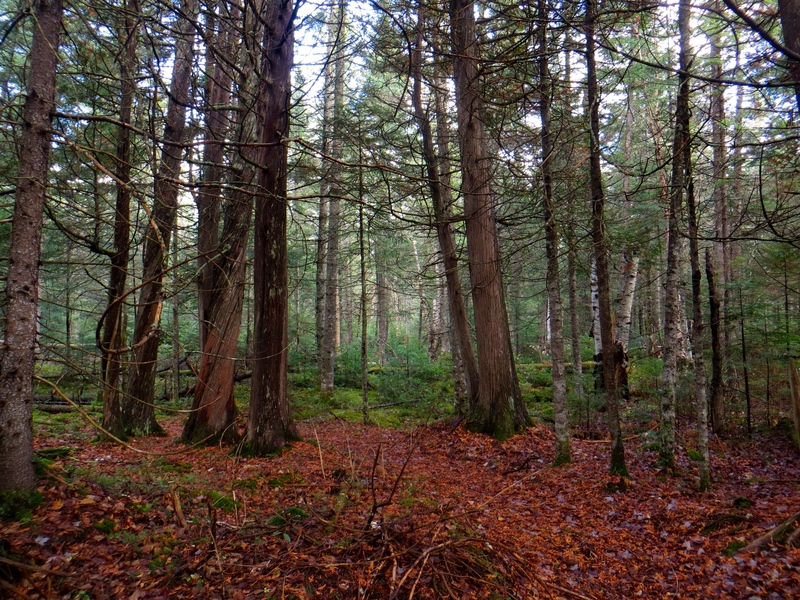 Cedar and spruce and moss–where are the Spruce Grouse? The day was cold (eventually it hit 40 degrees but not until the afternoon) and the woods were quiet. I was hoping to find at least one of four species I can’t find at home: Gray Jay, Boreal Chickadee, Black Backed Woodpecker and Spruce Grouse. The habitat was there but the birds were not. 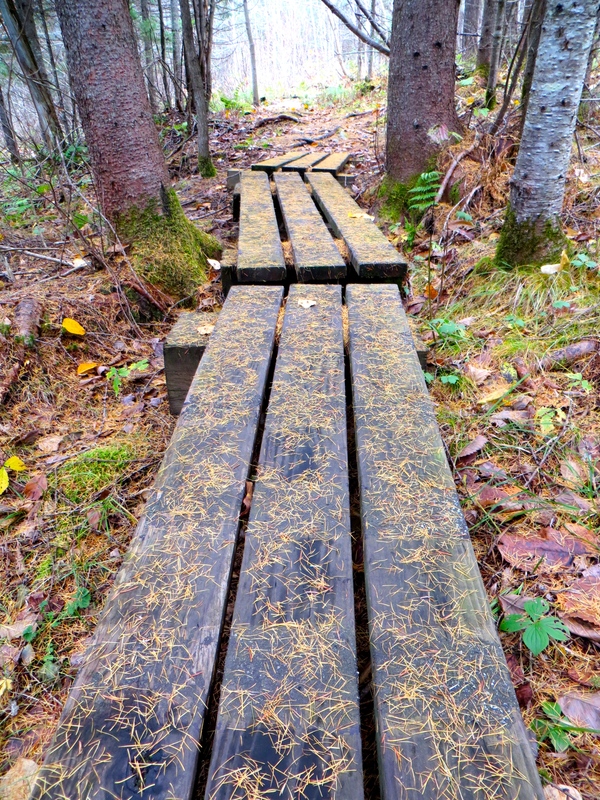 I walked slowly, headed down a side trail to Moose Bog in a couple of spots but I struck out. Maybe it was too cold, maybe it was just the wrong time of year. It was certainly beautiful, and peaceful, and I was happy to explore. Once I tapped out Wenlock I drove up the road to find the Sylvio O. Conte National Wildlife Refuge. I found a loop trail and tried that, with only a few Black Capped Chickadees, more Golden Crowned Kinglets, and a Robin or two. Again, quiet. I headed back up the road to the visitor’s center to try there. That place is beautiful–a stone and wood building with a fine view, some displays, information and lots to learn. I tried the river trail that loops from there. Golden Crowned Kinglets were the bird of the day for sure. There was another passel of them here, flitting and singing and making themselves known. The trail wound by the river, which was high, so I couldn’t hear much for a good ways. 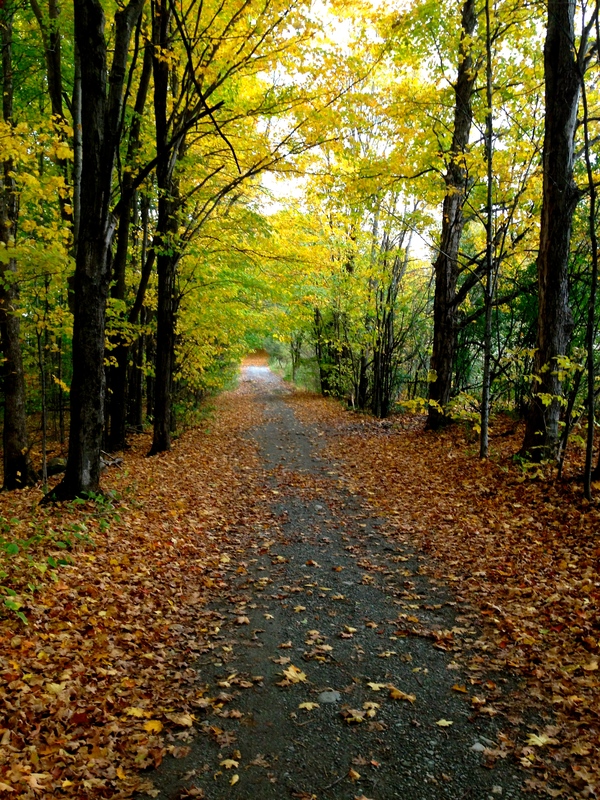 Again, I found few birds but the place was beautiful, even after peak foliage had passed. If felt great just to be out there. I just don’t do that enough. The color to be noted that day was yellow. Aspens were still holding on to yellow leaves and tamaracks were turning and shedding needles. Yellow dotted the hills and any open spots in the woods, and a carpet of yellow needles covered the ground in spots. It was cold, it was calm, and I felt energized by the quiet of it all. If you see all those four species I was seeking in one day you can call it the Northeast Kingdom birding grand slam. I was pitched a no-hitter. But I will go back there one of these days. There is a state park nearby and maybe this summer we can go up as a family. Maybe in the summer I can manage to get a hit, even if I don’t hit it over the fence. Today is Blog Action Day and the theme is inequality. It is appropriate, therefore, to share some thoughts on some programs that have been around a long time to help alleviate the challenge of inequality–federal Trio programs. Most people have not heard of Trio, yet the first programs began in 1965 and have helped millions of people gain education beyond high school. They are called Trio programs because originally there were three programs–Upward Bound, Educational Talent Search and Student Support Services. The first two work with students in high school and the third with students in college. The idea of these programs is to assist disadvantaged students with higher education attainment and success. Disadvantaged in this case means students from low-income families, who are of the first generation to go to college, or who have disabilities. Upward Bound was the first program, started in 1965, as one response to the War on Poverty. The program continues to work with high school students, guiding and coaching them on how to succeed in high school, how to apply to college, and how to be successful once they get to college. Talent Search was added in 1964, a similar but not as time-intensive program, and Student Support Services, working with college students to help them be successful once they got to college, began in 1968. Since then five more programs have been added to work with adult learners, veterans, college students who strive to attain graduate degrees, and others. The Council for Opportunity in Education (COE), a nonprofit membership organization for Trio programs across the country, notes that over two million students in Trio programs have attained higher education degrees. These programs are a huge success for this country. They help those who might not otherwise go to college to do so. This obviously helps them, but I would argue it helps us all. Getting a degree means having more opportunities, and it means being a more informed citizen. Our democracy wins when more people go to college. I have worked in these programs for several years, and I have seen stories of success. I have seen the Bosnian and Vietnamese and Sudanese refugee families send their children to college, despite working minimum wage jobs because that is all they can get in the United States. I have seen students who have gone to several public schools before graduation (in one case a student I worked with attended 12 schools in as many different towns) still get the support they need to get to college. I have seen students become college student government presidents and start their own businesses and become nurses. And students have told me that they would not have gotten as far without Trio programs. Does it work for every student? No it doesn’t. When I see a student get pregnant her first year in college and then drop out, when I see a student give up in her first semester, when I see a student simply not start and work for minimum wage for years, I do get discouraged. But then I see a former student who is still plugging away part time in Community College classes, determined to get that degree, and I am hopeful again. We all should know more about these programs, and we should support them. They are cost effective, they are well respected, and they work. For more information check out COE’s Trio programs summary page. And if you are up for it, tell your representatives in Washington to support Trio programs. They are the ones who vote to keep them going. If we want to fight inequality we sometimes have the tools we need in hand. We just need to know we’ve got them to use. Driving back from the market yesterday morning I rounded the corner and was taken aback, as they used to say, by the beauty of the view. I saw my house across the field, the hill behind it lit up with autumn color. Early yesterday fog rolled out and clouds tossed around the sunlight and it was a stunner of a day. I started off my morning a trip to Shelburne Pond to look for birds. I was rewarded with a new one for the year for my county list–five Ruddy Ducks were swimming and diving just out from shore. They are not common around here so it was a treat to watch them for a while. I saw some late Red-Winged Blackbirds and heard a Song Sparrow singing. I came home to hear Meadowlarks calling and chattering in our field. There were half a dozen of them, pausing on their way south. I am fortunate to have an amazing view right from my house. I can watch the hills, this time of year, as the leaves turn yellow and red and orange as color makes its way down the hills. Soon I will be seeing snow on the summits and we will be thinking of skiing. I will seek out more migrating birds today at some point, get out there and enjoy these colors while they last. Halloween isn’t far off. By the time we carve up pumpkins and get some costumes ready and collect all that candy, these leaves will already be turning to dirt. Ok, I pretend to be responsible all the time. I sometimes feel that, although I am supposed to be an adult, I, like many others who are supposed to be adults, am just winging it. I guess I manage to pay my bills and buy life insurance and take the kids to the birthday party, but I don’t really know what I’m doing. I get the responsible thing done, in the end, but don’t tell anyone that the seat of my pants is really what flies the plane around here. When it comes to businesses who advertise and sell things and affect lots of people, I feel like a different attitude should hold sway, however. I mean, you can’t just say or even infer that your product or your company is one thing when really you are pretending. Exaggeration shouldn’t be allowed when lots of dollars or lots of people are involved. I saw an example of such hyperbole today, on a paper towel dispenser in a restroom at a conference I attended. It is this last line with which I have an issue. “Closed loop” to me means a cycle. In this case I am led to believe that paper gets used, recycled, turned into paper, recycled, and so on. The “loop” gets “closed.” A loop keeps going. It doesn’t stop. Otherwise it is not a loop. In this case, however, there are three things, but they are not in a loop. 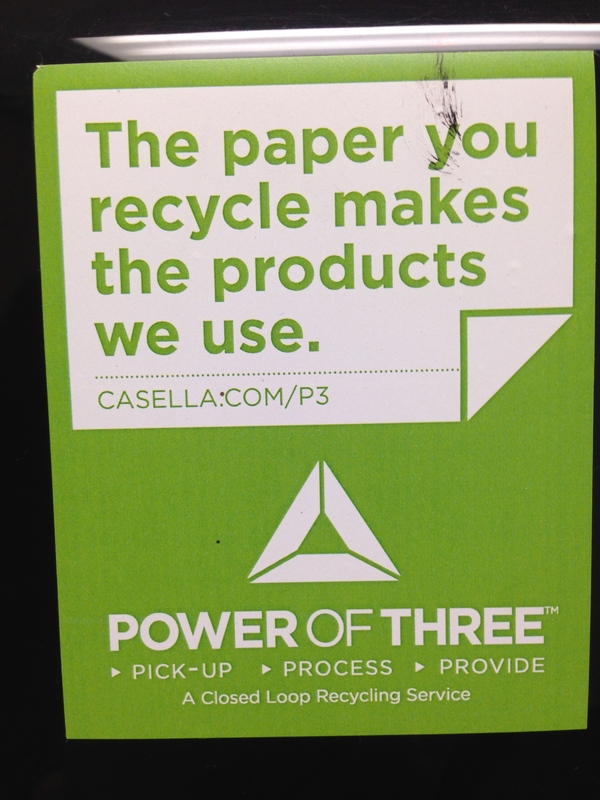 To sum up the “Power of Three” here: the paper company collects paper, uses it to create further paper, then sells it, possibly to some of the same people who provided the paper they collected. This is a good thing. It means that at least some paper gets made from recycled paper, rather than from trees. But this isn’t a loop. The original paper comes from trees. The recycled paper gets turned into lower grade paper–it is downcycled. Eventually it cannot be turned into paper any more, as it is too degraded. There may be some back and forth here but it is definitely not a closed loop. What wrapped up the whole thing into a tidy little ironic package was the waste basket below the paper dispenser. 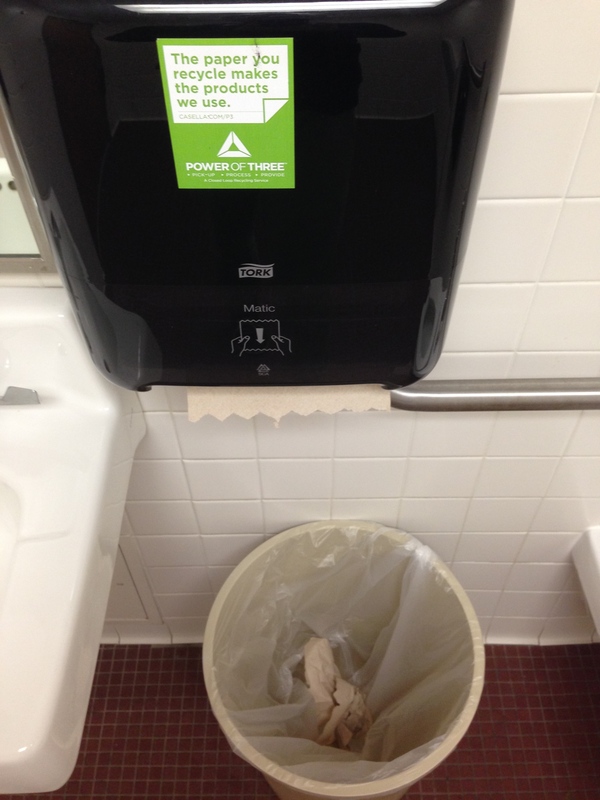 The paper in that dispenser may have come from paper, but the paper being dispensed ended up in a plastic bag in a landfill. The top of that plastic trash bin makes a closed loop, but I am guessing that is not the one to which the paper company was referring. Before I left that little room I realized I had a closed loop of my own. I had picked up my water bottle, I had processed the water, and then I provided a product to be taken away. That product would get recycled and perhaps one day return to me when I filled my water bottle again. Sounds like I might know what I am doing after all but let’s be honest, I’m still just winging it. Earlier this week I left my car in a parking lot and came back to find this. I had finished early, working at a school, and decided to take some time to go birding out on the bike path. This meant that I had to leave things in my car once I drove there. This included my laptop and wallet. I didn’t want to take those with me. These valuables were hidden in the back, not at all visible, the car locked. There were other people in and out of the lot. It was a bright sunny day. I didn’t see any rare birds, or anything unusual. I did encounter over 500 geese near the shoreline, which was a little crazy to hear. That many geese make a bit of a racket. It was a beautiful day. I felt restored and ready to get back to work once I drove out of there. I did not, however, drive out of there for a while. My initial reaction was “You’re kidding me. Seriously?” In my eternal optimism I briefly hoped that this was straight up vandalism and my goods would still be there. They were not. The question I asked out loud, “Who does this?” was not answered. Someone was desperate enough to leave the scene without offering me answers. So I got to call 911 again. I reached a New York responder, got connected to a Vermont responder, then to the local police. I gave my information and waited for someone to show up. I wasn’t freaked out or frightened or even angry. I just felt tired. I knew it would take a good chunk of time to deal with this, many phone calls to start with, then running around to deal with replacing stuff and fixing the busted window and trying to keep this from getting worse. So I started calling. The laptop wasn’t mine but my employer’s so I had to call them to get things remotely disabled. I had to call my insurance company to file a claim. They asked me the value of things taken and, in my haste to provide an answer, undervalued pretty much everything ($15 to replace iPhone headphones? Um, no). I called a couple of banks to cancel some cards as well. And my spouse to let her know I would not be home for a while. The police officer was friendly and helpful. He said there had been several other similar crimes around town and they even discovered the perpetrator–went to his house and found a pile of stolen goods, although he was not there and still remains missing. I assumed I would not see my own things again. They no longer belonged to me. I spent a long time on the phone, wanting to take care of as much as possible before I headed home. My phone battery limited my task list. Once it hit 3% I put the phone in airplane mode and made the breezy ride home. My charger, of course, was with my laptop. The next two days I cancelled what I had planned (which was a big ouch considering the time sensitivity of much of the work I had to do) and dealt. I ordered new credit cards and debit cards. I made the trip to the DMV to get a new driver’s license. I got new ear buds and a phone charger. I replaced my laptop bag and various items from it. I worked with my IT folks to get a new laptop, name badge and parking permit. I dropped off my car, got a rental for the day, and picked up my car once it had new glass. I was efficient and effective and only got frustrated once, so it all got done. 1. I just got my driver’s license renewed a few weeks ago. The photo was pretty much terrible, for the first time ever. Really. I got a new one with a new photo. That one is much better. 2. I got to drive a Jeep Compass for a day. I can’t say I especially liked the car (can you say poor visibility? ), but it was fun to drive something new. 3. It happened when the weather was ideal all around. Imagine having no rear car window in the rain, or snow, or bitter cold. 4. I got, yet again, a new perspective on my life. I had to deal with this hassle, but it was about stuff, mostly. Stuff can be replaced and we move on. 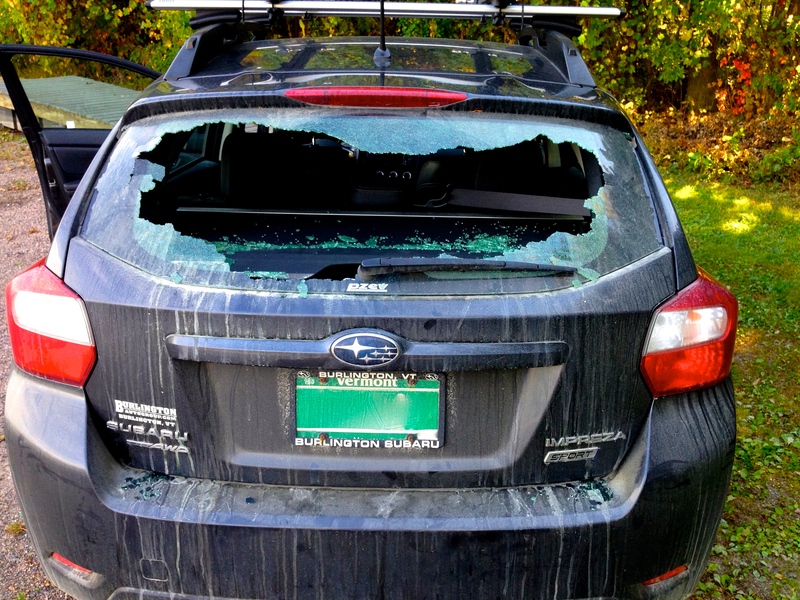 I am not the one who is so desperate that I need to break into someone’s car and steal things that will mostly be garbage (that laptop was instantly a hunk of metal and plastic–no getting into that) and to create havoc in someone’s else’s life. More than anything, I feel sorry for that person. So here is to new experiences. Sometimes they are a drag, no doubt, but I always learn something from them. And to the person who felt the need to do this: I forgive you. I hope you can get your life together soon.